behind a car that had an unusual Obama bumper sticker on it. 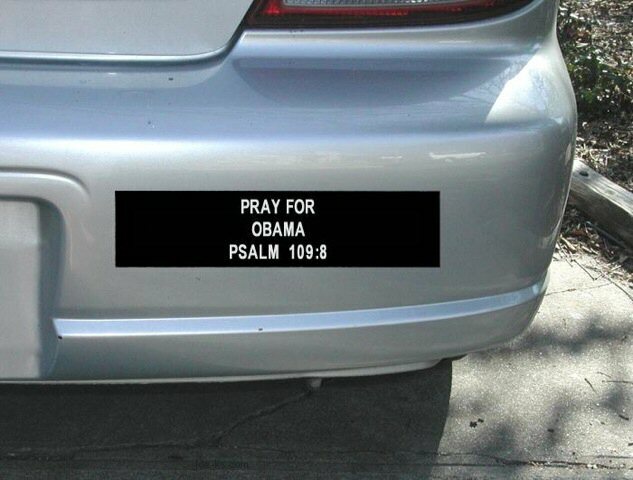 It read: “Pray for Obama. Psalm 109:8”. When we got home my wife got out the Bible and opened it up to the scripture. She started laughing, then she read it to me - then I had a good laugh too. At last I can honestly voice a Biblical prayer for our President! Let us all bow our heads and pray. Brothers and Sisters, can I get an AMEN?